What is the right way to organize ICOs, ensuring the process is quick, secure, and not too costly? In today’s market there are a few options for launching an initial coin offering (ICO) – you can do everything on your own, bring in outside consultants, or engage a team that have already launched their projects. However, each of the options has its pros and cons. Presently, there are upwards of three hundred projects that are running their own ICO, with another twenty ICOs appearing on the market every week. The main question facing the companies that decide to attract financing via an ICO is about the right way to technically organize the process such that the collection of funds is quick, secure, and not too costly. If you opt to pursue an ICO on your own, you can forget about minimal timeframe. The development of the technical, legal, financial, and marketing components of the project from scratch will take half a year at the very least. You also cannot avoid making some common mistakes either. 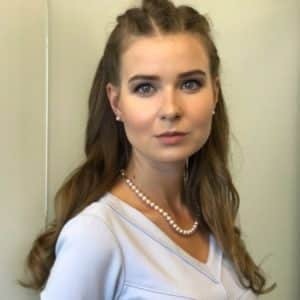 Another complication is recruiting personnel for the project: experienced specialists are scarce on the market and expensive, while training “rookies” will also take time. Engaging outside consultants can speed up the process, but you must be ready for considerable investments. People are queueing up for experienced teams, the price tag is in dozens of bitcoins, and in addition, some consultants charge a percentage of the revenues from the project. Also, it is hard to “feel” ready-made solutions by outside teams: some are bound by NDA, others have worked only on separate parts of different projects and do not have a whole picture of how all this is supposed to function. According to many industry experts, an option that is becoming more optimal as time goes on is buying a ready-made solution from a team that has already realized their project and are ready to share their materials with the industry. Indeed, “Buying a solution from a team that have already completed their own project is one of the most efficient and safe options. The solution has already been tested, with intelligible and measurable results. The team have confirmed experience, not on paper, and not spread among a hundred of other participants. That experience and that solution can be seen in operation,” noted Artur Azizov, CEO of B2Broker. In September and October, the B2Broker team themselves ran a successful pre-ICO for their platform B2BX, which have now reached an ICO stage with nearly €6 million already collected. 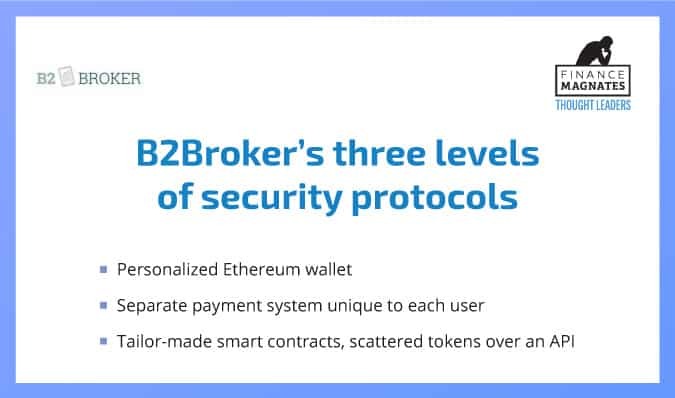 Now B2Broker is ready to provide to external clients a whole IT-infrastructure for conducting ICO, which can shrink the whole process of preparing the technical stuff to a mere 2–3 weeks. For its part, B2BX’s system consists of two blocks: smart contract and token issue. For every client, the company writes a smart contract, which is 99.9% resistant to hacking, and then issues tokens. Additionally, the group includes a ready-made ICO cabinet accepting six cryptocurrencies, including BTC, BCH, ETH, LTC, DASH, and XMR. As the client (token-holder) registers the cabinet, they enter a secret phrase and a personal Ethereum-wallet is created for them. The company does not keep any private keys on its server, and therefore, having hacked the developer’s personal cabinet, a hacker will only obtain open addresses, which are open on blockchain, anyway. This constitutes a payment system – completely sovereign, it creates an individual address for each user. B2Broker also prepares its own smart contracts for a client and issues tokens on the cold wallet installed with the client. They themselves install only an Ethereum-wallet, which scatters tokens on an API. 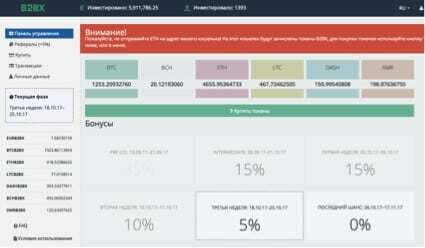 If the B2Broker wallet gets hacked, there will be almost nothing there as the principal funds are held on the client’s wallet. Also, in the cabinet for ICOs, a referral system (bounty) has been created where one can see the number of investors and the number of tokens for each of them. It is the referral system that allows collecting large sums, as a user can invite a friend and receive tokens for that. The percent rates can be made the same for everyone or individual for certain partners. There are also a system for entering dates for the calculation of client bonuses and a transaction function for a user to be able to check their token buy operation on etherscan. “It is not a kind of solution that will take some more tinkering after the money from the client has come. We are already using it for our project B2BX. However hard they tried to hack us, the cabinet has withstood all the attacks. That is why we’ve decided to sell it: if there is a demand, why not help our colleagues and share our experience?” she added. According to data from the American consulting company Architect Partners, 59 percent of the ICOs conducted from June to September this year were a failure as they were not able to collect even 75 percent of the targeted funds. These consultants forecast that in the near future, the market will reach saturation, which will require greater thoroughness in preparation and development of all systems for new projects. Thus, those who use ready-made, well-tried technical solutions will gain advantage over the others and achieve the financial goals they set for themselves.